For the first time in two years, Microsoft’s Xbox won a monthly battle in the U.S. game console wars. Microsoft sold 422,000 Xboxs in February, while Nintendo only sold 398,000 Wiis, according to NPD Group. 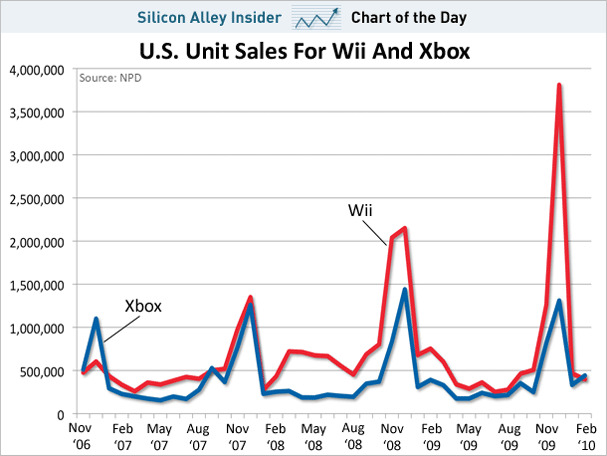 The last time Microsoft outsold Nintendo in the U.S. was in September 2007. 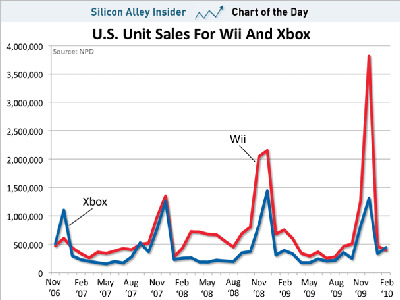 Between then and now, Nintendo has sold 24 million Wiis, while Microsoft has sold just 13.2 million Xboxs. While February was a nice victory for Microsoft, it could be short lived. Edward Williams of BMO Capital says in a note for clients, “limited supply negatively affected the hardware unit sell through” for the Wii.